John Gale was born on December 13, 1953 in London, England. John Gale started playing poker in 2004, but you wouldn’t know, he is such a new player by watching him play. John Gale won his way into the 2005 World Poker Tour PokerStars.com Caribbean Poker Adventure via a WSOP satellite at PokerStars. Thanks to the satellite, John Gale got to enjoy playing in a poker tournament in the lovely Bahamas. John finished first out of 461 players to win $890,600. This victory changed his life. John Gale lost interest in his day job as a business management consultant, so he sold his business to play poker full-time. The month after his WPT appearance, John Gale made the money in the European Poker Tour. In the 2005 World Series of Poker, John finished in the money four times. His 2005 WSOP run included a second place finish while playing pot limit holdem. 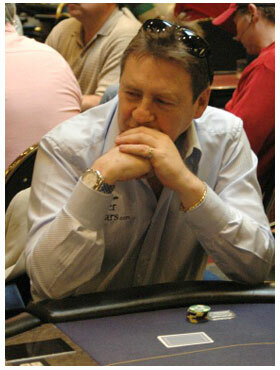 John Gale would win his first WSOP bracelet the following year at the 2006 WSOP, when he won a pot limit holdem event. John Gale currently lives in Bushey, which is on the outskirts of London. He no longer plays for PokerStars, despite having come to fame through them.